those are pixel errors created when ceilick was making/fixing tiles for the frosthool levels, and it happened that the bottom right (or left) corner for them happened to have that odd pixel. most of them are fixed, anyways. -Removed the 'static' screen from the end story, now includes a stock image of the BwB flying through space with "to be continued"
Keen 8 - The same bug with the opening text crawl has occurred. Keen 9 - Don't forget the repeated "of" in the Story section. -In the Game section of the help menu, on Page 21, it says "other" twice when discussing that there may be other places for Keen to visit. -When I made it to the Warpcore level, I got an error message, stating that there wasn't enough memory for background music. 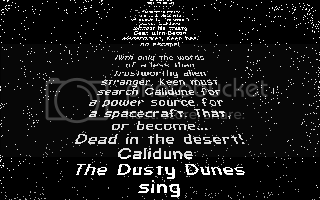 Keeper wrote: Keen 8 - The same bug with the opening text crawl has occurred. THE DUSTY DUNES ARE ALIVE WITH THE SOUND OF MUSIC...! Strange, Keen 5 1.4 is definetly the one we used, and unlzexe'd naturally, since ckpatch wants it unpacked anyway. I wonder what else could prevent the thing from loading. I know I once had a similar bug with Save the Quillsheep, but don't ask me why it works now. My guess would be that dosbox doesn't find a file you need (either some path problem or some file is simply missing). Make sure Keen9 uses dos compatible path names (8 chars max, no spaces) and try again is the only thing I could suggest right now. Thanks for the link - turns out my Keen5 .exe was ok (no difference to the .exe in your link), but I must've been playing an old version (mine had BotB.pat, your link has patch5.pat.) It looks like some stuff has been removed from BotB.pat compared with your version, so I guess that's why it works. Incidentally it seems you don't have to unlzexe keen5e.exe - I copied my original exe over the top and it still worked fine. I think ckpatch decompresses it in memory before applying the patch. Dheadshot is linking the original release, not the latest beta. The patch file names have been changed in the latest beta and work fine on my end, so I don't know what the issue here is. Also you seem to be correct about not needing to unzlexe! Can some other people confirm this? If so, I'll remove unzlexe accordingly in future versions. The game starts normally and everything seems to be in order. Ceilick wrote: Also you seem to be correct about not needing to unzlexe! Can some other people confirm this? If so, I'll remove unzlexe accordingly in future versions. Starting in CKPatch version 0.9.0, it supports 'transparent lzexe decompression' so the keen executable gets unpacked in memory automatically before it gets patched, so you don't need to unlzexe the executable on the disk first. CKPatch 0.9.0 came out in 2003 I believe and I am pretty surprised by the number of mods still being released with it included. Even some by people who weren't even in the community back when unlzexe'ing was required! Anyway, short version: unless you are using the stone age version 0.5.1, no you do not need to include unlzexe with your mod, and the player does not need to decompress the executable. Ceilick wrote: Dheadshot is linking the original release, not the latest beta. Unzlexe was not needed. When I downloaded the original Keen9.zip back on February 3 of 2011, I copied all the Keen 9 files to their own directory, then copied all the original Keen 5 files over to the Keen 9 directory without replacing. The game worked fine. Last edited by Syllypryde on Sat Dec 17, 2011 21:59, edited 1 time in total.